In a tiny living room this week I was a guest at a birthday party. Actually, I was the complete guest list. A precious old lady throws a party for herself at this time each year and I’m not sure how many people are invited but generally I’m the only one who attends. There have been years when there were two or three of us who gather to celebrate the life of this gorgeous old thing. At one point she asked me if I would like some savoury biscuits with french onion dip. I politely declined but it caused her to yell at the top of her frail voice, “Then I will have bought them for nothing!” I was served a few small biscuits with a blob of dip in a saucer and I ate them all, including the soggy few that had sat in water. A fellow travelled a long way to visit me to discuss his possible fifth wedding. He told me that he thought there was something in wedding cake that caused women to lose their appetite for physical intimacy. In a way, he was saying that love is an illusory idea and the only comfort in life on offer is the first “discovery” phase of a relationship. One wonders why he would want to go through this cycle yet again. It’s not for me to judge. I think the man feels trapped by his own neediness and that a man’s inborn desire for love is some kind of cosmic joke. I agree that intimacy must be lost, simply because there are clothes to wash, there is shopping to be done, and money to be earned. As we do these everyday things it’s inevitable that we form firm ideas about the one we love. 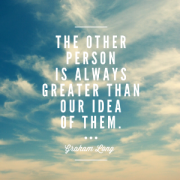 But the other person is always greater than our idea of them. The trick is to turn from our ideas long enough to be captured by the awesome that captured us in the first place. Anyway, I’m only telling you this story so that I can share with you the funniest quote of the week. The man thought he was quoting the bible to me when he said, “A camel cannot live by bread alone”. I love my life.